Jesus Is My Homeboy: How much can you know about yourself if you've never been in a fight? In the film Fight Club Tyler Durden poses the question, “How much can you know about yourself if you’ve never been in a fight?” By that measure I knew very little about myself. I knew nothing of what it actually meant to have someone ‘front me up’ or ‘give me some verbals’. Yet these experiences are common in the urban environment we find ourselves in: drunken, drugged-up people leaving clubs, opportunistic, bullying muggers, or groups of ‘hoodies’ are all somewhat stereotypical. Still, I think we’ve all experienced them (perhaps first-hand) to know how intimidating the world we live in can be. We’re also bombarded with statistics about knifepoint robberies, gun-crime and general intimidation of members of the public going about their every-day lives. Sometimes, the way the media portray our wonderful city you could be forgiven for thinking we live in a war-zone. Some part of me wanted to address this gap in my experience. I frequently asked myself: what would I do if I got into a difficult situation? I’d met The Fella at a Circusboy’s birthday party and started following him on Twitter. He’d posted a video of some Urban Krav Maga. I’d watched with interest and thought I’d give it a go. It was with these facts in mind that I entered the Virgin Gym in The Plaza, Oxford Street one Wednesday last September. I was more than a little nervous. Perhaps it was because my only experience of any Martial Arts classes had been a few Karate lessons as a round, nervous ten-year old. More likely it was the unknown: I really didn’t know what to expect. I introduced myself to an intense, Scottish man Stewart McGill: the instructor. Who. You. Would. Not. Mess. With. He seemed like a smiley, humorous kind of guy but I had a vague sense of previously committed past mayhems. The tamed Dark Side. He professed a love of heavy metal and that set my mind at ease being a fellow fan. He guided me into the gym for the start of my first class and asked me to remove my watch and labret piercing. This did little to calm my nerves as I looked around the class and saw people from a range of sizes, and backgrounds and a few women too. I have worked as a secondary school teacher for seven years now and I can’t help but judge the quality of any learning situation. Whilst the gym setting was unfamiliar and unsettling to me, it was still an educational environment; there were certain things I was expecting. In the back of my mind I had three areas I was (sub)consciously judging to see if Urban Krav was something I was going to commit time, money and effort to. Firstly, is the teacher credible? By this I really mean do they know what they are talking about. OK Stewart might have looked the part but there are enough people walking around London who look like they can handle themselves in a fight. In teaching a subject, one of the ways I distinguish my knowledge is technical language. Stewart explained the technical aspects of each move, and demonstrated them. Not only that, he would walk through each move step-by-step giving a detailed running commentary on each aspect of the move. Fair enough. If you’ve participated in any Martial Arts classes before, I’d guess that would be what you’d expect. However, what really enhanced the technical expertise for me, were the reference points from other Martial Arts. Stewart frequently includes in his instructions phrases such as: “Traditional boxers would…”, “MMA guys approach like this…” or “Ju-Jitsu teaches…” This breadth and depth of knowledge established credibility very quickly – but the guiding purpose is Stewart’s phrase “In a street-fight…” peppered with the word “nasty” (his Scottish accent increases its brutality). This gives the classes a practical slant for instant applicability to the urban melee. But knowing your stuff isn’t enough. I know people who are incredibly intelligent but absolutely terrible at passing on their knowledge. This relates to the second area I was judging: what’s the teacher’s relationship with the class like? From my own teaching experience, I know that when pupils respect the teacher and enjoy the classroom environment, they’re far more receptive to learning. Beginning to learn Urban Krav is no exception. Participants fully embrace the serious subject matter because of the dark humour and very colourful (but totally realistic) language that permeates the classes. Make no mistake – I think undertaking any kind of Martial Arts training should be tough. Doubts about my own ability perhaps fuelled my nervousness. Training needs to be mentally and physically stimulating and Urban Krav certainly is. However, the balance between pushing oneself and building confidence can only happen in a space where learners are comfortable and safe. This is especially true where people could seriously injure themselves. Stewart (with the other instructors who are frequently in attendance) maintains control over the environment with a watchful eye whilst we train. His authoritative air is (relatively) easily established because everyone knows he could hurt any one of us. Badly. And with ease. Despite that slightly disconcerting background awareness, Stewart and the instructors invite questions with humility and humour. I’ve always felt able to approach and ask for help or feedback on a particular move. In truth, the class is an environment of collaborative learning; I have gained a lot from other participants too. This is actively encouraged and there is a refreshing absence of ego. Nevertheless, a knowledgeable teacher, and an appropriate relationship are just the foundation – the proof of the pudding is in the eating: did I learn anything and will I continue to learn something? This can’t get answered from the first class – it has to be pursued. Yes, after the first session I felt I learned something. A few months on and I’m still learning something new from each class. As a teacher, I plan for progression with my pupils. I have an idea of where they should be by the end of term. To the untrained eye it seems as if Stewart and the instructors are making it up as they go along. In truth, they’re completely guided by the group in front of them. The balance of beginners and experienced attendees can vary wildly by session. Serious formal planning for each class makes no sense; rather there is a deeper awareness of the individuals in the room. Stewart and the instructors are constantly observing class members and have developed an instinctive understanding of what’s needed. This is high-level instruction. That doesn’t mean there is no structure. There is a syllabus and in my last session I was formally assessed at Level One. This involved several minutes of pressure-testing, handling the Ten Most Common Street Attacks. I didn’t pass. This time. I was a little frustrated but the instructors have a clear commitment to high standards. Anything else would do me (and anyone who attends) a disservice. So, I highly recommend Urban Krav Maga: credible, knowledgeable teachers, an effective relationship between instructors and pupils in a mutually respectful environment and a clear commitment to learning. This training is varied, challenging and fulfilling – if you stick at it. Last September, I remember leaving my first session thoroughly tired and slightly giddy having experienced getting my hand in someone else’s sweaty face (and vice versa). Everyday life does not offer us the chance to experience our own naked aggression. The closest I usually get is a heavy metal gig. Urban Krav is different. Each week, I am invited to unhinge, embrace and eventually learn to control and use my aggression. It leaves me a little more confident each time. 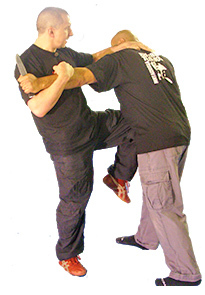 buy Urban Krav Maga 6-DVD Box Set: defending the most common street attacks. Content Copyright: James D'Souza. Simple theme. Powered by Blogger.